A war for your money is raging and it is time to fight back!In a book that will forever change how you spend your hard earned money, America’s favorite financial coach, David Bach, shows you how to save thousands of dollars every year by taking on the “corporate machines.” In these times when every dollar counts, big businesses are using dishonest tricks to rip you off, making themselves billions while they keep you living paycheck to paycheck. 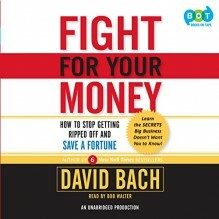 David Bach knows that until you learn to fight for your money, you will overpay for almost everything you buy. In Fight for Your Money, he gives you the tools to FIGHT BACK and WIN. Bach shows you how every dollar you spend is really a battle between you and the businesses—and the government—who want to take it as profit. When you know how the system is rigged –the extra points, the hidden fees, the late charges, the unused tax breaks, the escalating rates—you can fight back against the pickpockets and save literally thousands every year—money in your pocket that can help you live your dreams. Fight for Your Money shows how you are being taken on your cell phone contract, cable bill, car purchase, credit card, life insurance, healthcare, 401(k) plan, airfare, hotel bills, and much more. Bach gives you all the tools you need to fight back, with websites, phone numbers, sample letters and real-life stories of ordinary people who have fought for their money and won. You’ll learn how to: Beat the credit card companies at the games they play that cost you thousands annually in interest and feesMake your bank accounts work for you with higher yields and lower feesSave thousands by pre-paying college tuition at TODAY’s pricesRaise your credit score and pay thousands less in mortgage interestCut your life insurance premiums in half by making one callSave hundreds on air travel, hotels, and car rentals—just by being an informed consumerAvoid huge rip-offs like bank-issued gift cards, medical credit cards, 401(k) debit cards, and sneaky renewals of your cell-phone plan.David Bach knows that when you are being taken financially, you work harder than you have to, for longer than you need to. This book helps you fight for your money, so you can live your life doing what you really want to do.